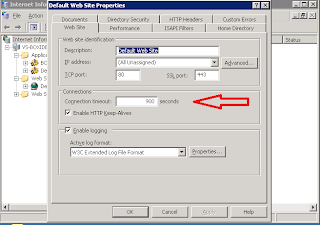 My environment is one where users access reports on an IIS (Internet Information Services) based InfoView web application There was a Business Objects user that runs a particularly large report every day. Due to the size and activity on Business Objects lately, the report will repeatedly time out after quite a few tries. "An error has occurred. Request timeout". This is basically as generic of an error text that you can get. Me and my users were not very happy with these occurrences but one day I found the answer. When searching the actual Business Objects Support site for the exact error text, I found the attached resolution. It increases the timeout from two to 15 minutes. I tried this in Development and the user no longer got the report to error with the time out. 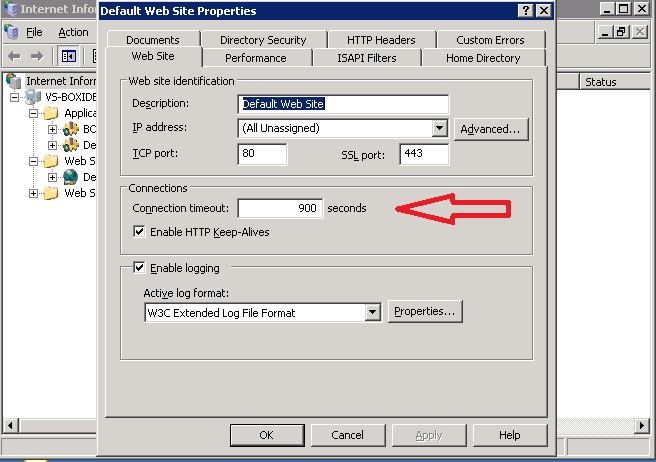 Update the connection timeout from 120 to 900 seconds for that particular site in the IIS manager. I tested this process while logged in to InfoView in DEV. Whether you run a report or are navigating during the IIS restart, there is no difference in service. Therefore, there is no outage associated. However, I would bounce the Business Objects servers for good measure. The back out plan is to change the IIS setting back to 120 and backup and restore the machine.config file. Welcome to the blog for After-Hours Coders, LLC. We look forward to sharing some of the various tips and tricks we encounter in the field to benefit the greater Information Technology community. We’ll have most entries about SQL Server Database administration, Business Intelligence and other miscellaneous topics.